It’s learned through experience, whether it’s yours or somebody else’s. Through your life, you’ve had thousands of experiences. Hundreds of thousands of conversations. Perhaps a million or more people you’ve passed on the street, waited for the bus with, shared a farmer’s market day with listening to a bluegrass band. All of these people, conversations, things, smells, dreams – all of these memories contribute to your perception of what common sense should be. What is “common” is actually the aggregate of not much more than that very small intersection of shared experience, whether it’s first hand or learned. 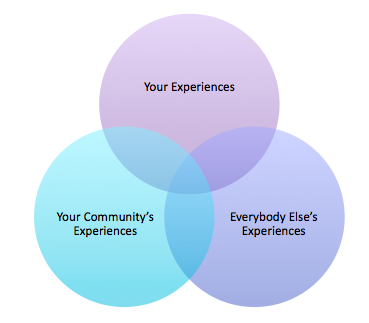 For many, what matters most is the overlap between you and your community (those you spend most of your time with). The challenge with that is that over time we begin to assume that everybody else is much more closely aligned with you and your community, which is more likely than not, not the case. Nobody has the exact same set of characteristics that flow into their definition of “common sense”, because we are all making the same subconscious assumption that you “get” what I “get” and everyone should “get” generally the same set of principles. That, most fortunately, is not the case, and we can continue to learn from each other. So next time you feel the urge to ask yourself “I thought that was common sense,” ask yourself if that’s actually the case. You might find an opportunity to teach someone something new or better yet, learn something new.